"SEO is not something you do anymore. Its what happens when you do everything else right." Does your company need a full marketing department but doesn't have the manpower? This comprehensive marketing consulting package will give your business the resources you need to execute the robust marketing plan you've always needed to take your business to the next level. We do the research to discover what your business does well, where it can improve and what keywords you should be targeting. We build out your content portfolio with social media posts and content specifically designed to improve your search rankings and increase customer trust. We unify your business' directory listings, and work consistently to improve your rankings in your targeted keywords. Optimization of all current website pages as well as link building, local optimization and keyword ranking reports. We give you the infrastructure to collect positive reviews and ratings to make your local search profile stand out. We will build you a website specifically designed to maximize your content strategy, and help implement a plan that keeps it up and running at blazing mobile and browser speeds. We will leverage the tools we build into your website and marketing system to make effective sales and marketing funnels. We manage and produce a regular podcast as part of your content marketing plan. We will manage and run all email marketing campaigns to gain and nurture leads. We help you build the foundation you need to continue to grow your business month after month. Don't have the available manpower to take your business to the next level? 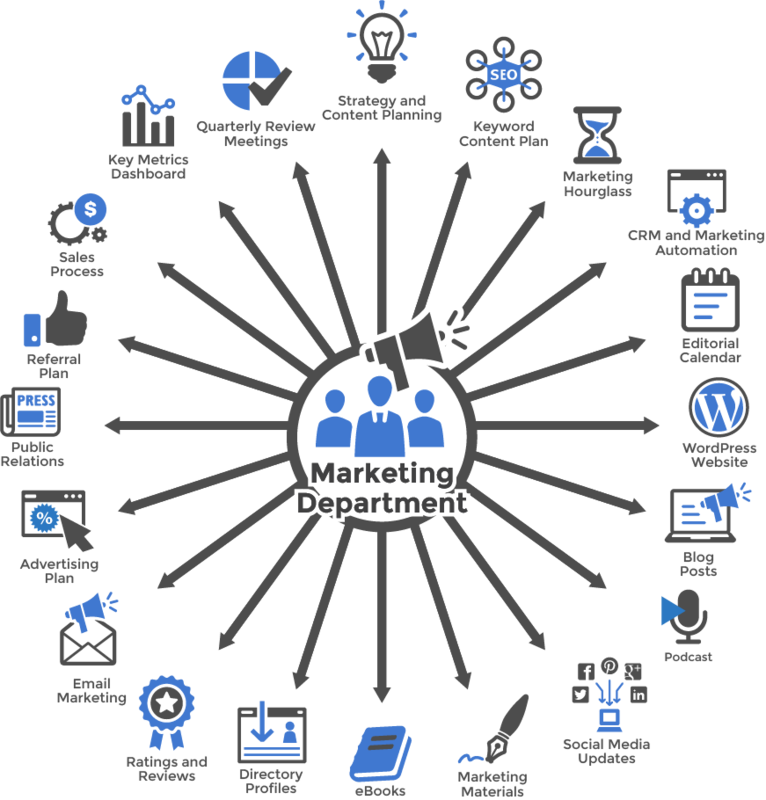 ﻿Supercharge ﻿your business with a Marketing Department Program today!